I have burgers franchises on the brain this week it seems, man I miss Royale! Jozi is starved for a gourmet burger joint. This isn’t new, but I wish we’d see more of this in South Africa, given that 56% of women and 29% of men in Mzansi are classified as obese. Apparently urban black women need to spend the most time on the treadmill, followed by women of mixed ancestory, then whites and lastly Indians. Fresh Apple ‘fries’. I see what they did there. 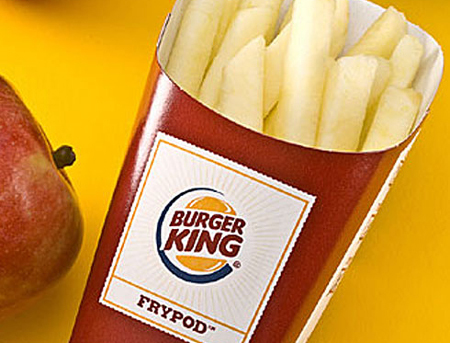 Burger King in the US offer Fresh Apple Fries, served neatly in a French-fry box. How cute is that?! I think local fast food retailers could follow suit and offer more than just awful Greek ‘salads’ made with iceberg lettuce. The bloat, people! The bloat. I also love how overseas websites like this offer uber concise nutritional information on every product they serve. 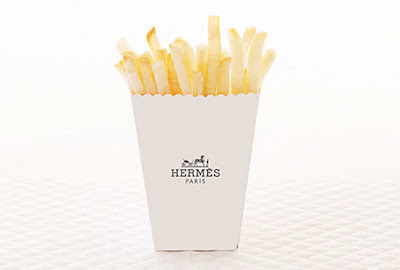 If you must, do fries the French way.